The first sign of the spider mite’s presence is a dusty substance on the needles, which turn brown and then drop off. Silk threads on the twigs are also indicative of a spruce spider mite infestation. A simple detection method can be used to round out the diagnosis: shake a branch over a piece of white paper, and you will see some tiny dark mites (tiny spiders with four pairs of legs) quickly moving over the white surface. This species has at least four generations per year in Canada, depending on the region. The first generation usually attacks old foliage whereas subsequent ones prefer new needles. 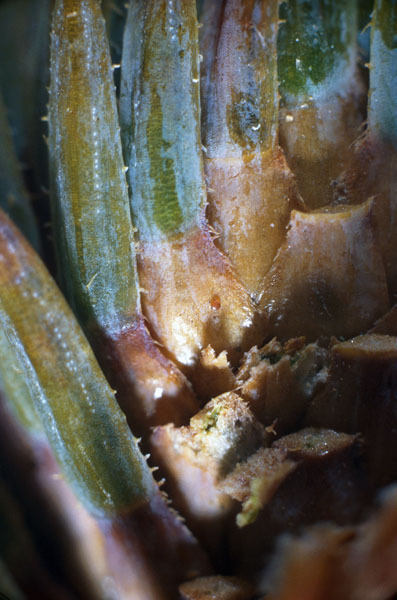 By sucking sap out of the needles while feeding, the spruce spider mite causes the foliage to discolour gradually. In addition, it secretes an abundance of silk threads and uses them to web together needles and twigs, which then serve as shelters. The damage begins inside the branches located in the lower crown and gradually spreads outwards and upwards in the tree. 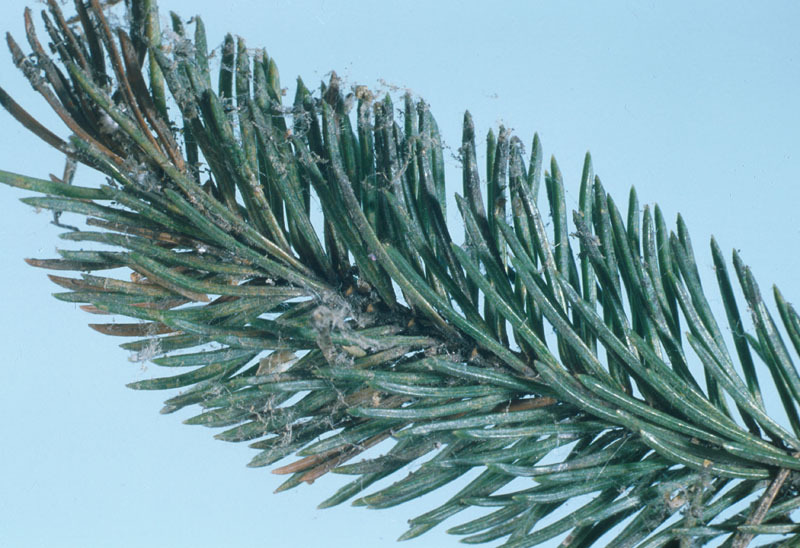 In Canada, spruce spider mites can cause sporadic or localized damage to various species of conifers. This species is also a problem in nurseries. 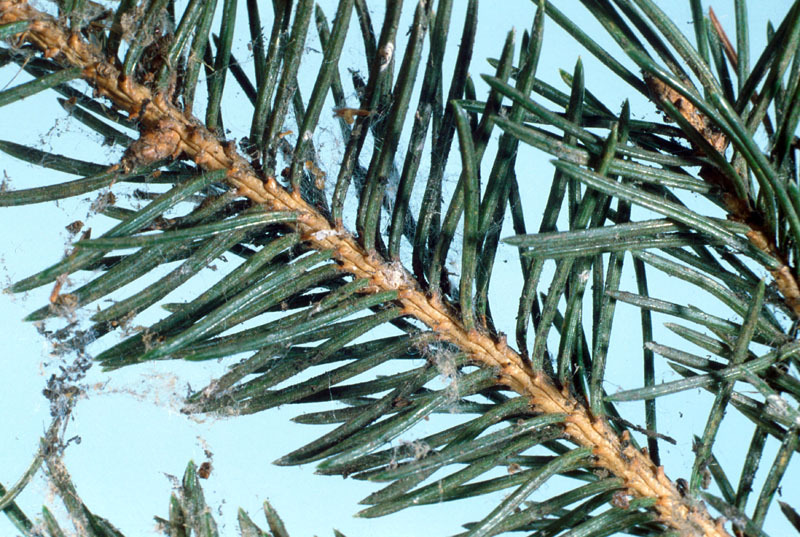 The last serious spruce spider mite outbreak in British Columbia occurred in 1975, when 800 ha of forest, mainly young Douglas fir, were severely affected. 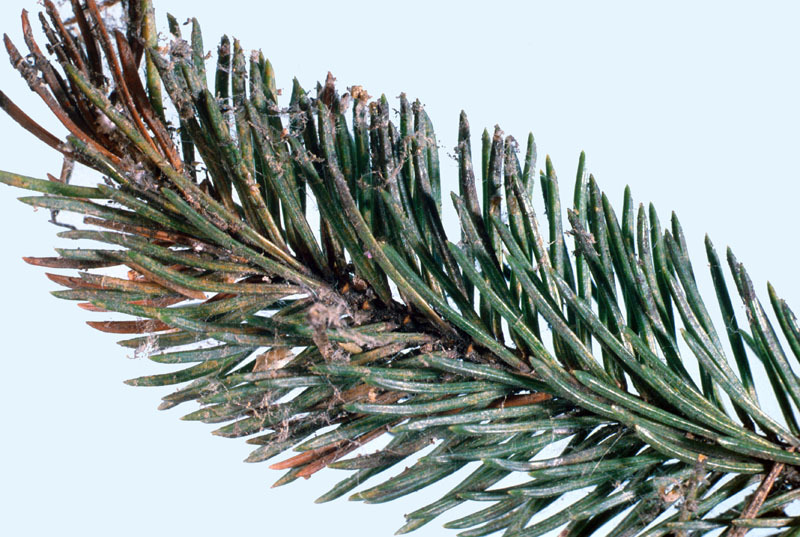 Spruce spider mite populations remain low during periods of high humidity and heavy rainfall. Infestation in ornamental trees can thus be avoided by abundantly spraying the damaged tree on a regular basis and repeatedly, in order to destroy the silk threads and dislodge mites. This will also increase the moisture level of the foliage and thereby hinder mite development.